Portable electronics have taken over the world. From smartphones to tablets, it feels like every home and workplace is connected online. But for industry work, finding a PC that can accommodate all your needs can still be a little tough. Because your typical consumer laptop doesn’t make use of RJ45 ports or RS-232 connections. Which leaves many people using full sized devices, adapters, much older equipment, or another type of inelegant solution. GPD isn’t quite as large as a brand like Microsoft, but they’re actually one of the bigger handheld electronic companies in China. 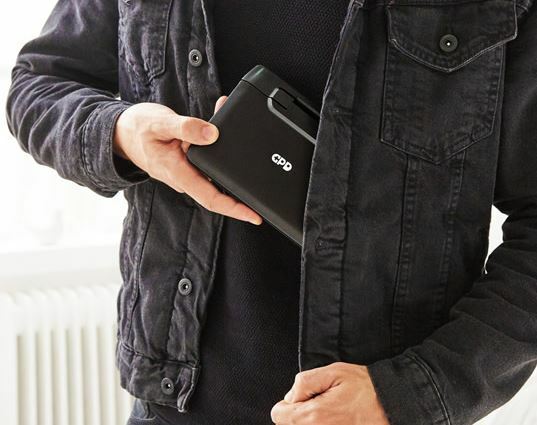 Probably best known for their Pocket 2, GDP has made a number of portable devices aimed at gamers or consumers. 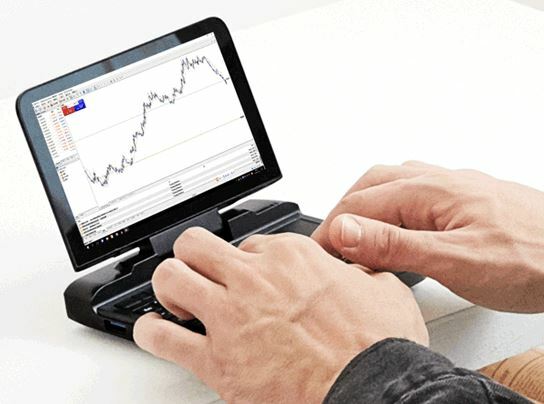 But their MicroPC is something special; it’s a multi-interface mobile productivity tool that’s totally business oriented. 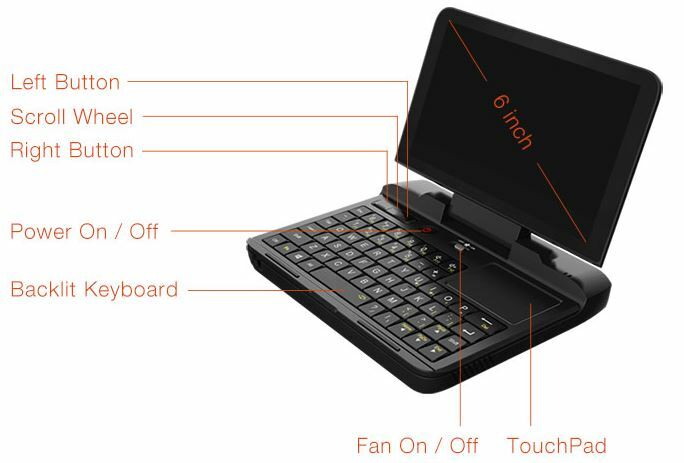 The MicroPC GPD got its start on Indiegogo. Getting tech from crowdfunded campaigns can be pretty hit or miss. Half of the time, it feels like the product that’s promised never actually materializes. But GPD has actually completed several large campaigns prior to their very successful MicroPC campaign. So there’s not much room for concern. 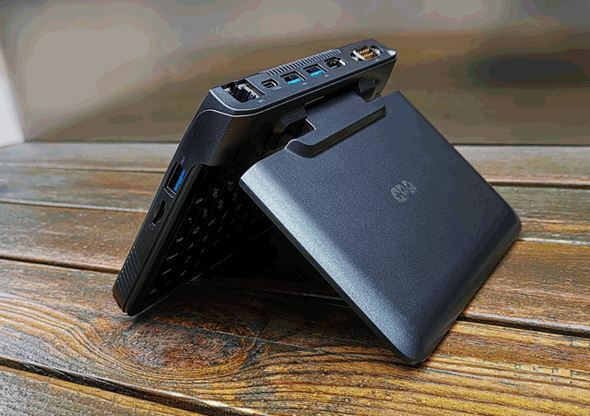 As a device, the MicroPC can be tough to wrap your head around. It’s technically a laptop, but being only 6” large, it’s probably one of the smallest laptops to ever exist. When you’re headed towards the 6” form factor, a lot of people are drawn to select tablets. But the MicroPC is like a strange middle ground between tablet and notebook, a bizarre hybrid of several technologies. In fact, the GPD MicroPC was basically built to complete in a head-to-head versus the Surface Pro. How does it compare? Well, both are based around Windows 10. Both screens are protected by powerful Gorilla Glass. Though if you’re interested in splitting hairs, the MicroPC is protected by the Gorilla Glass 4 instead of Gorilla Glass 3, which is what the Surface Pro uses. They both include a built-in Wi-Fi card, they both include support for Bluetooth, but only the MicroPC includes a wired LAN card. For wired network applications, whether for logistical or security reasons, that can be pretty handy. The MicroPC has a considerably smaller screen size, measuring about 6” diagonally. In the interests of portability, that’s pretty fantastic. Those kind of minor differences really help distinguish this MicroPC from typical tablet-style devices. Both use an SSD drive and offer infinite capacity or expansion. When the screen is in the downward position, the MicroPC measures 6.0 x 4.4 x × 0.9 inches. Once you prop open the screen, the height of the case extends up about five inches. From a material standpoint, the chassis is pretty solid. It’s primarily made form impact resistant ABS, and is made with a thickness of about 1mm. It weighs just barely under one pound. That’s lighter than similar devices, like the Surface. Fairly sturdy by any measure. And the material is supposed to withstand a modest impact, but you really wouldn’t want to treat it with any less care than you would treat a smartphone. Assuming the screen is closed, then accidentally dropping the MicroPC wouldn’t be nearly as bad as dropping your smartphone. But if you plan on entering rough-and-tumble environments with the MicroPC, it wouldn’t be such a bad idea to slap a screen protector on the display anyway. The display is actually pretty attractive, it’s constructed to deliver a wide 178° viewing angle, as well as support wide color gamut (WCG) tech. The 1280 x 720 resolution is appropriate to the screen size, producing a higher number of pixels per inch than you’ll find on a Surface tablet. Apart from the standard QWERTY layout, you’ll find a scroll wheel and a fan on/off switch. Flipping off the fan can be useful when you’re not running anything that’s putting a strain on your system because it can save you power. 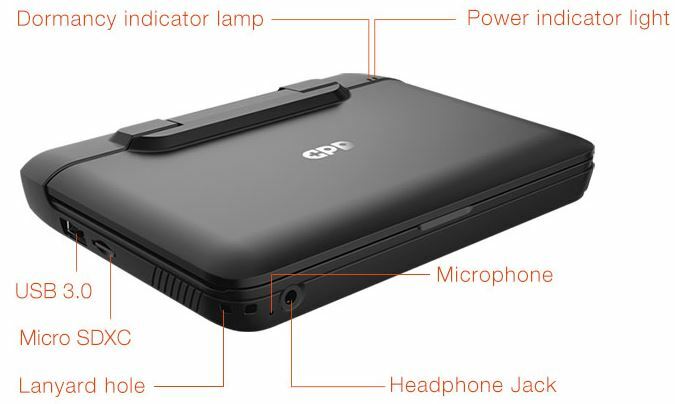 The MicroPC GPD is constructed with a built-in lanyard strap. The included strap can be removed or swapped as necessary, and the mounting hole can support about ten pounds of pressure. In other words, it will handle the weight of the MicroPC easily, but you don’t want to go tugging on it as hard as you can. All in all, the strap is pretty handy for ensuring the MicroPC doesn’t actually have to suffer a fall. Just wear it around your wrist while using it, and the worst can be averted. And it’s pretty great for securely carrying around the MicroPC without having to resort to some type of carrying case. In addition to the strap, the outer edges of the casing have been given a few grooves to help improve your grip. These groove grips don’t make a night and day difference, but they can help a lot if your hands happen to be moist during operation. Another distinguishing feature of the MicroPC is how it takes on cooling. On the backside, you’ll find where the exhaust vents help push dust and air out of the MicroPC. Tablets like the Surface Pro typically rely on passive cooling rather than active cooling. 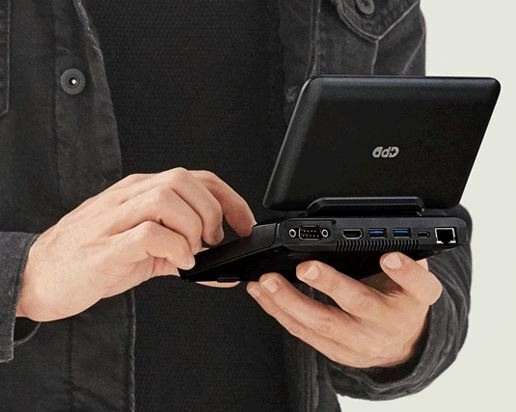 But being a small notebook rather than a tablet, the MicroPC has enough power to warrant a little extra airflow. What kind of power, exactly? The GDP MicroPC is built with 6GB DDR4 RAM, which is pretty close to average for modern portable electronics in this price range. For the sake of comparison, the Surface Pro is built around 8GB of DDR3 RAM. Basically, the RAM in the MicroPC is a bit faster, but it has slightly less overall capacity. This PC only runs about 10W running at full power, a pretty low powered design that compares favorably with a Surface tablet. Partially because the hardware was selected in such a power-conscious way. Under the hood, you’ll find an Intel N4100 processor, a pretty basic quad core processor. The system is rounded out with a 128GB M.2 SSD. That’s capable of providing a pretty rapid 576MB/s read speed, and an equally quick 465/MB/s write speed. If you need more space, the GDP MicroPC has theoretically unlimited expansion potential. The QWERTY touchpad is pretty intuitive. Anyone who’s used a keyboard will feel at home. Additionally, the keyboard is backlit. Very useful for using it in darker areas, plus it looks pretty cool, like any backlit keyboard. You can also flip off the backlighting it you don’t need it and want to conserve battery power. The worst thing you can say about this interface is that an analogue touchpad feels a little dated, especially as people are getting accustomed to using touch screen displays. But there are a number of advantages to this layout. 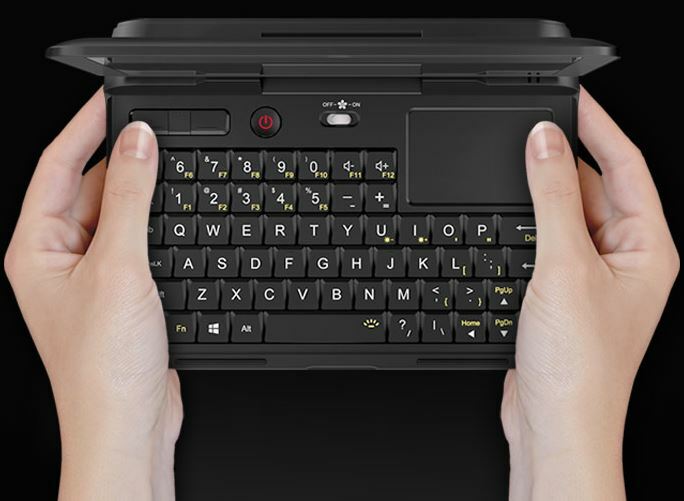 For instance, having the analogue pad actually ensures that the GPD MicroPC can be far more expandable. You’re not locked into a single operating system, for instance. In addition to the touchpad, there are a pair of right and left buttons, left and right click mouse buttons. Pretty intuitive stuff, which helps anyone who has ever used a PC start using the MicroPC effectively out of the gate. In short, it’s made to replicate all the roles a traditional notebook might undertake. That makes it ideal or people who are working in exploration, education, cell centers, communications, and so forth. The backside of the device is completed covered with ports, You’ll find an RS-232 port, HDMI 2.0 port, USB 3.0 ports, USB-C port, and RJ45 port. A couple of those ports are mostly used in automation or industrial control circumstances; the ordinary consumer probably wouldn’t have much use for it. But USB-C provides everything the ordinary user might want, including video, audio, and data transmission. Turning over to the left side of the device, you’ll find another USB 3.0 port, and a Micro SDXC port. When the MicroPC is closed, the top right side hides away a power indicator LED. The front has a built-in microphone, and a headphone jack. And for networking, you can do some hardware expansion through the RJ45 interface, to help you connect with a wired network access center. For Bluetooth 4.2 or Wi-Fi on both the 2.4G and 5G bands, your connection options are wide open. Whether you need to play wired or wirelessly, your options are wide open. 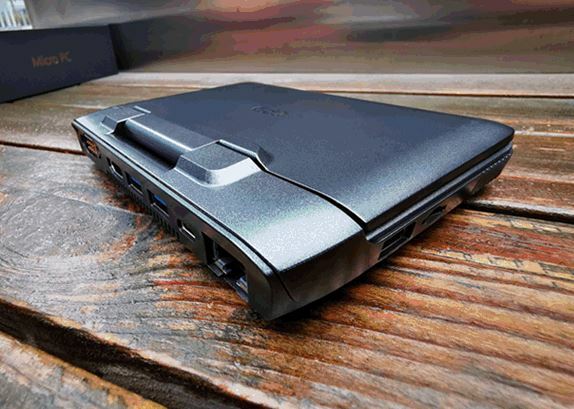 Even though this is one of the most portable laptops you’ll probably ever see, the HDP MicroPC was also constructed with more permanent installation options in mind. For instance, a pair of copper nuts are embedded on the backside of the MicroPC, removing them allows for a variety of mounted installations. Who Should Choose the GPD MicroPC? GPD has a variety of unique options that typically aren’t on tablets or similar notebook PCs. It has RJ45 port, RS-232 port, micro SDXC card reader port. It also has some common sense inclusions like four USB ports and an HDMI port. That means it could be used for warehousing, logistics, financial work, medical research, business presentations… the sky is the limit. You could even use the MicroPC for creating a home theater, though it’s somewhat clear that wasn’t exactly what the developers had in mind. This system has superior cooling to comparable tablets, as well as a price to performance ratio that’s far superior. Where other notebooks may get style advantages of over the MicroPC, it’s clear this device wins out from a purely practical standpoint. Unfortunately, the form factor of this laptop is a bit bulkier than things that GPD has made in the past. That’s understandable, given the target audience of this device, and the ports necessary to please that target audience. The big selling point for this device is unquestionably the I/O, and especially the USB-C. But if you need serial ports, and need something that you can throw in your bag and go, the MicroPC can be pretty useful.